Nestled in the foothills of the Appalachian Mountains is Chantilly Lace Floral Boutique, a local floral boutique with deep roots. Kathy and Frank Yuppa have been in the floral industry for more than 30 years. Kathy’s parents proudly owned a flower shop for 55 years, and her passion for design began there. Her son is also following in the family’s footsteps with his own shop located in Atlanta, Georgia. Over the years, Chantilly Lace has had the opportunity to work with many different people, including celebrities. They pride themselves on their custom work and love a good challenge. In fact, they are most well known for their custom work and the ability to transform a client’s vision into reality. This is one of the reasons their customers trust them so much. One of the things that Kathy loves most about floral design is the creativity she gets to show every day. Thought, love, and care are poured into each and every arrangement that is created at Chantilly Lace. Their design work stretches far beyond everyday arrangements. The wedding designs created at Chantilly Lace are breathtaking. 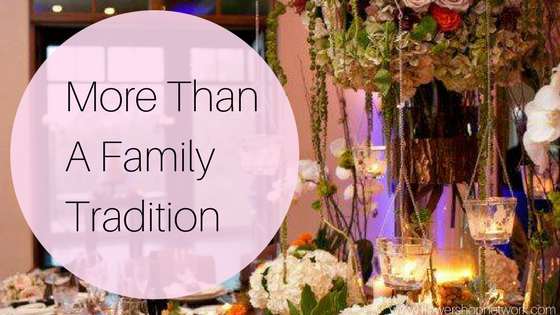 They will make sure the floral decor at your wedding will be remembered, from the bouquets to the reception. During bridal consultations, they take the time to get to know the brides. Each wedding is tailored to the couple’s needs, including design preferences and budget. Modern or traditional, they have done it all. With a previous location at the bottom of Lookout Mountain, Chantilly Lace has been located on Standifer Gap Road in Chattanooga for the last 3 years. If you are looking for a florist who doesn’t cut corners and loves to spend one on one time with their customers, keep an eye out for a charming brick building. That’s where you’ll find Chantilly Lace Floral Boutique! Not located in the Chattanooga area? Find your local florist on Flower Shop Network!